James S. Friedman, LLC, believes that regardless of the case or the issues it raises, every appellate client must understand how the appellate process works. Generally speaking, every citizen should understand how our legal system functions, since it affects so many of our basic rights. It almost goes without saying that the reality of our system differs dramatically from what is depicted on television or in the movies, or described in a novel. Further, although many of us may encounter a trial court at some point in our lives (as, perhaps, a litigant or juror), the odds are that most people who are not attorneys or judges will never see the inside of an appellate courtroom. Trial courts find the facts of a case by hearing witness testimony and reviewing other types of evidence. Everything that happens at a trial becomes part of the record. An appeal is based on the content of the record created at trial. Appellate courts do not hear testimony of witnesses, and typically do not consider new evidence. 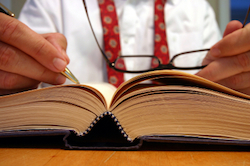 The trial attorney must therefore "make the record" at trial. A deficient trial record can lead to a poor result on appeal. Further, no two cases are alike. Different cases arise from different sets of facts, and every client is unique. As such, two cases may appear similar in certain respects, but then play out very differently at trial. The same is true at the appellate level. An appellate attorney must always remain sensitive to those facts and issues that distinguish their client from every other appellant, and their client's case from every other appellate matter, regardless of any perceived similarities that may exist. At the same time, appellants should not assume that an appeal will conclude with a particular result simply because a different appeal that appeared to be similar to theirs ended in a certain way. An appeal is commenced by filing a simple set of papers with an appellate court within the timeframe set by the applicable court rules. The defendant is then given time to obtain the transcripts of the trial court proceedings. After the transcripts are available, the clerk of the court will set a briefing schedule. The appellant's brief is filed first, and is accompanied by an "appendix" that includes important documents generated in connection with the trial that the appellate court will need to review the issues raised on appeal. The State (in New Jersey) or the Government (in the Federal system) then files it's responding brief. The defendant then files a final brief that replies to the arguments raised in the responding brief. This is all of the printed material filed in connection with the appeal. After the briefs and appendix are on file, the attorneys representing the parties may appear before the appellate court to argue the appeal. Here, the attorneys present their positions and respond to questions from the panel of appellate judges. The panel will then consider everything presented in the papers and at oral argument, and render a decision. The entire process can take up to a year or longer to complete. Finally, criminal appeals do not usually result in a dismissal of the charges or the case. If the appeal is successful, the appellate court will almost invariably return the case to the trial court for further action, which can include a new trial or a re-sentencing. The foregoing topics are discussed in greater detail on the subsequent pages. Please read them. Even if you do not retain appellate attorney James S. Friedman for your appeal, it is our hope that you will have a better understanding of the mechanics of criminal appeals. James S. Friedman, LLC, represents criminal defendants in the State and Federal appeals courts in New Jersey. If you are seeking to appeal a criminal conviction from the New Jersey Superior Court, or from the United States District Court in New Jersey, contact us online or call us toll free at 800-361-6554 today to discuss your criminal appeal.